A 13-year-old girl waiting for her mother to pick her up after school in Taman Melawati managed to escape being kidnapped. A viral tweet showing a police report filed by the victim reveals the details of the case. The student from SMK Taman Melawati was waiting at the back entrance of the school for her mother to pick her up after school. At around 6:50 PM, a Malay Male wearing a bright t-shirt, long pants and a black cap came towards her and told her he was asked by her mother to bring her home. She felt odd about the situation and asked him what her mother’s name is. He couldn’t respond. He immediately grabbed her backpack and ordered her to follow him home under the instruction of her mother. Again, she asked him what her mother’s name is. The man looked right at her and let go of her bag and walked away. At 7:10 PM, her mother arrived, and she told her everything. After her mother informed the school, they advised her to make a police report. The reason she made the report is that she’s afraid of her safety in the future. At the same time, she hopes the school can increase security especially during the hours where students are picked up and dropped off. PDRM reveals that every day, 4 children go missing in Malaysia. Although the majority of cases occur not because of kidnap but children running away from home, we frequently see news of abduction or attempted abduction in Malaysia. 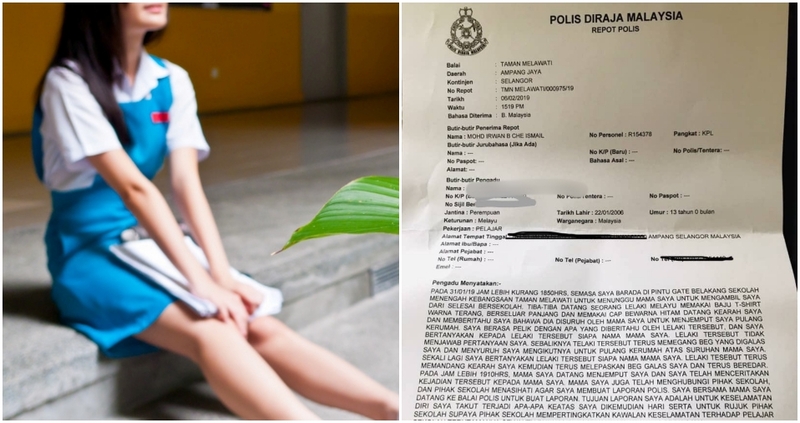 Last year, a 4-year-old girl almost got kidnapped at an AEON in Kepong. In 2016, 12 suspects were arrested for kidnapping a 17-year-old boy in Penang. At the same time, it’s important to educate children on how to respond to dangerous situations. The 13-year-old girl who made the report above was cautious enough to verify the identity of the adult. If she was not so careful things might have turned out very differently.